Los Angeles, CA. Sun, sun sun. Oh and wine and produce growing locally all year round. Why I came to fall in love with LA. I LOVE Mexican food. It has to be one of my favorite cuisines. It’s so fresh and expressive in its flavor. It just reminds me of summer and gives you that carefree “I’m on vacation” feeling, no matter what time of year it is. Living in LA was a definite plus when it came to fresh and healthy food options. 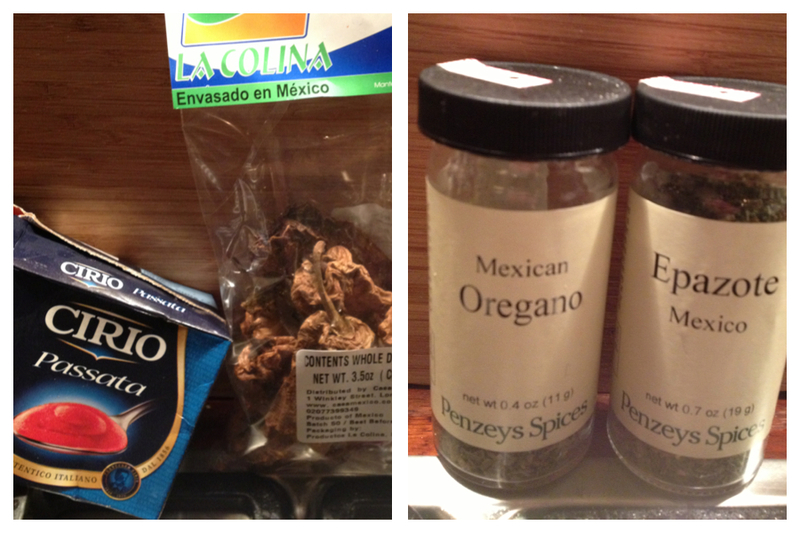 Mexican cuisine is obviously a major culinary heavyweight, due to the vast Mexican population and proximity to Mexico. The food is so simple thanks to the freshness of ingredients and simple cooking techniques, you don’t need to go to a 5 star restaurant to enjoy it (small, dive-joint looking places are the best anyway!) and you don’t need to take cooking lessons to make it at home. 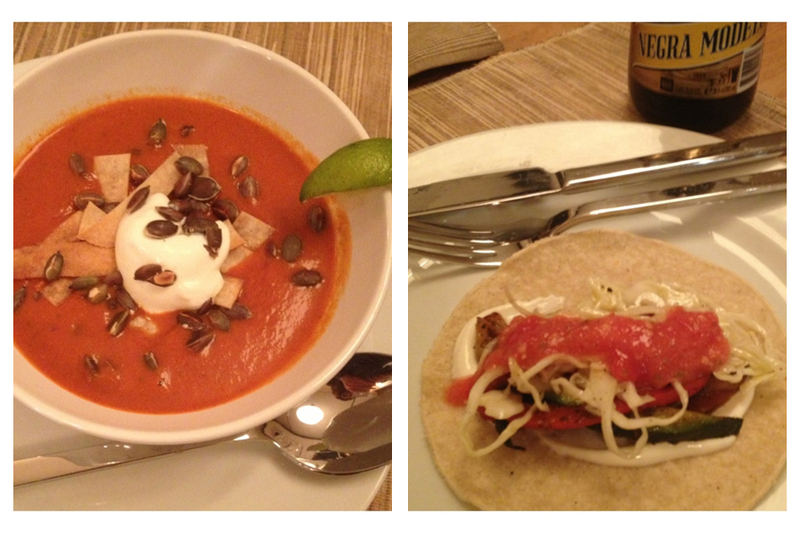 This is my recipe for super easy tacos and delicious creamy tortilla soup. 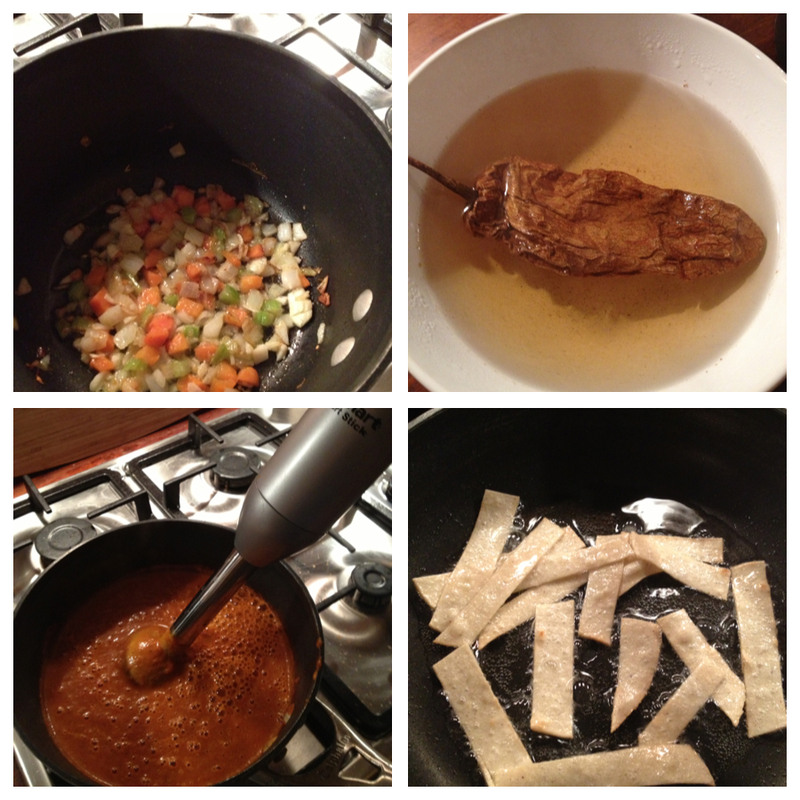 I’ve adapted this recipe from my favorite Mexican hole in the wall in LA called Loteria. Their tacos and tortilla soup are truly incredible. In a pan over medium heat add a tbsp of olive oil and the diced carrots, onions and celery. Cook for about 3 min until the onions are translucent. Add in the garlic and spices, cook for 2 min. Add can of tomatoes, agave or sugar and s&p. Chop the chipotle and add it in along with its soaking water. Cook on med-low for about 10 min. Stir in the yogurt, sour cream or soygurt. Toast the pumpkin seeds in a dry pan over high heat until they start to pop. In a small pan heat 1 tbsp of oil and once hot, add in the tortilla strips. Fry for about 1 min until golden brown and crispy, remove to paper towel and soak up access oil right away. 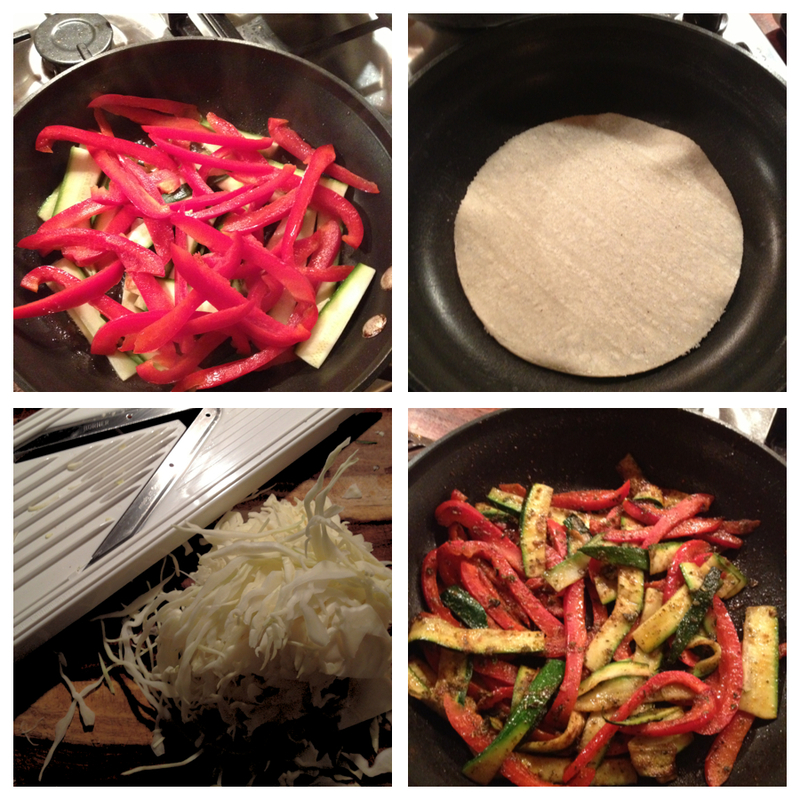 In a medium size sauté pan over medium heat, place a tortilla. Heat for about 30 seconds on each side. Set aside on a plate, covered until ready to serve to keep warm and soft. Add 1 tbsp of olive oil to the pan and add in the zucchini and pepper. Cook for 2 min with lid on. Add the spices (except coriander) and garlic. Continue to cook for about 6 min on med-low heat, covered. If you have a mandolin (see photo) use this to shred the cabbage finely. Otherwise it can be done by hand. Place in bowl and add the 2 tbsp of extra virgin olive oil, apple cider vinegar or lemon juice and s&p. Toss and set aside. If you have a food processor, great! Use that to make the salsa. If not you can certainly chop everything finely by hand. Add the tomatoes, onion, lime juice, and s&p to the food processor and blend until it has salsa consistency. Add the coriander to the yogurt, sour cream or soygurt. Place the creamy tortilla soup in a bowl and top with a dollop of cream (yogurt, sour cream or soygurt), place crispy tortilla strips on top and sprinkle with pumpkin seeds. 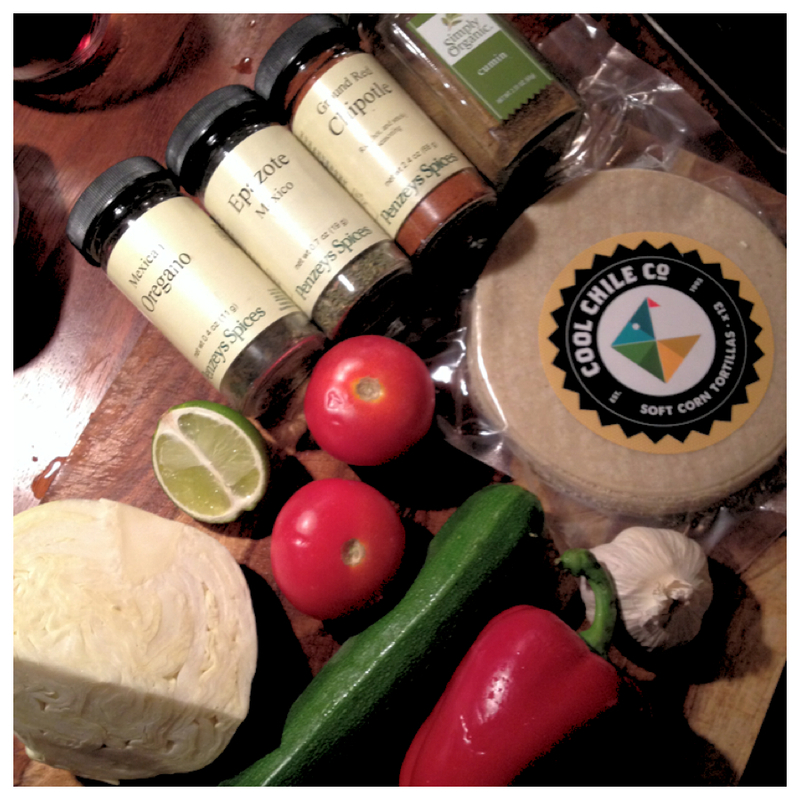 Squeeze the lime wedge over soup and sprinkle with fresh coriander (optional) before eating. Arrange a warmed corn tortilla on a plate, smooth on some coriander infused cream (yogurt, sour cream or soygurt), then a helping of zucchini and peppers, a scoop of shredded cabbage slaw and finally the salsa. Some hot sauce if you want to give it some extra heat. 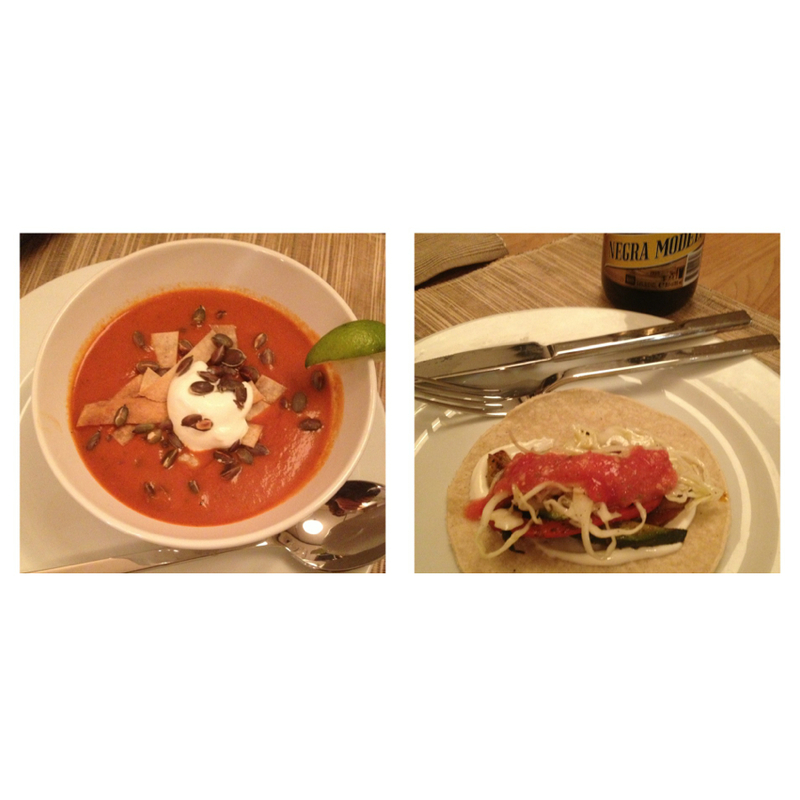 This entry was posted in BLOG, LA LA LAND (LOS ANGELES), RECIPES, SOUPS, Uncategorized and tagged dinner, easy, fresh, low fat, mexican, model diet, soup, tacos, tortilla soup on April 9, 2013 by Kelly O'Dell.